To commemorate our sixth year we bring you the December issue in Four Volumes. Volume One: Civil & Human Rights. Volume Two: Arts & Culture. Volume Three: Poetry. Volume Four: Conservation. Guest Editorials by: Dr Lezlee Brown Halper, Tibet Scholar. Dr Namrata Goswami, Research Fellow. Noel Monahan, Irish Poet. Chris Mercer, CACH. 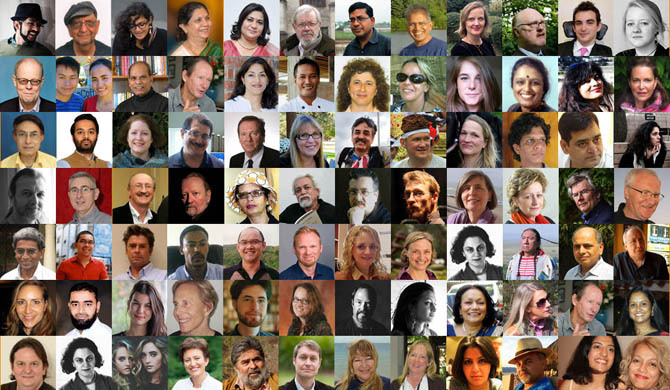 We thank our 2015 contributors from : Brazil, USA, Canada, Ireland, UK, Germany, Vatican, Norway, Italy, Saudi Arabia, Turkey, Israel, Iraq, Iran, Ethiopia, Bahrain, Pakistan, India, Sri Lanka, Thailand, Cambodia, Laos, Indonesia, Australia, South Africa. Terry McDonagh, Randhir Khare, Putu Yudana, Gabrielle Borrmann, Natalie Wood, Dr Candess M Campbell, Aryaa Naik, Jill Gocher, Sybelle Foxcroft, Professor J P Das, Natasha Tusikov, Adi Patell, Ciara O’Connell, Dr Cynthia Banham, Dr Emma Larking, Dr Nimmi Kurian, Dr Ola Tunander, Kristina Johansen, Nathan Willis, Perinaz Avari, Tom Kilcourse, Ali Khan Mahmudabad, David Gardner, David Morgan, Dr Anuradha Bhattacharjee, Gary Zaetz, Jayson S Lamchek, Professor Ella Habiba Shohat, Chris Mercer, Elizabeth Willmott-Harrop, Ernie LaPointe on Tatanka Iyotake Sitting Bull, Heather Brett, Noel Monahan, Professor Daya Somasundaram, Professor Ganesh Devy, Dr Terje Østebø and Wallelign Shemsedin, Maha Noor Elahi, Mariana Prandini Assis, Ozlem Warren, Rinki Bhattacharya, Chaitanya Guttikar, Dr Budi Hernawan, Dr Stig Stenslie, Joo Peter, Perinaz Avari, Dr Altaf Qadir, Dr Ivo Coelho, Dr Róisín Sarah, Dr Stig, Romit Bagchi, Carla Ferstman, Jacinta Mulders, Patricia Weiss Fagen, Vivek Mehra, Camilla R Barker, Daniel Holt, Dr Namrata Goswami, Dr Nuray Aykin, John Thorpe, Ela Gori, Mersi Stone, Kori Jean Olsen, Kelsi Olsen, Mong and Houa, Tapan K Ghosh, Dr Lezlee Brown Halper, Joachim Matschoss, Pavan Malreddy, Sophie Gallop, Dr Veerendra Mishra, Noel Monahan, Noel King, Geraldine Mills, Miceal Kearney, Dominic Taylor, Jim Burke, Colette Nic Aodha, Suzanne Stone, Valmik Thapar, Paul Casey, Suzanne Stone, Dr Bayu Wirayudha, Mareike Riedel, Azadeh Hosseini, Lavanya Khare, Andrew Forster, Sarita Kaul, Shruti Kaul, Ela and Hari Gori, Jiten Gori, Rainer Tormin. Organisations: SAGE Publications (Smrithi Sudhakaran), Dr Benjamin Authers and Dr Emma Larking of Regarding Rights (Australian National University), The Norwegian Peacebuilding Resource Centre/Norsk Ressurssenter for Fredsbygging (NOREF). We regret if we have left anyone out of the list. Kindly inform us immediately so that we can add you! 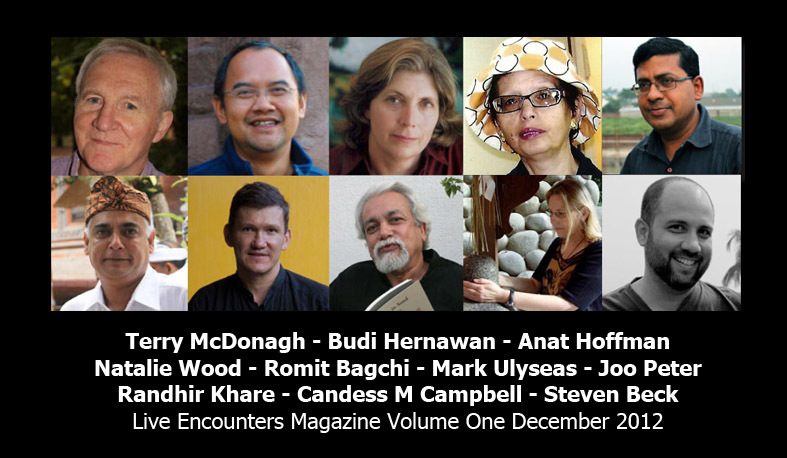 Live Encounters December 2012 mega issue is out in Volumes One & Two featuring guest editorials by Anat Hoffman – Civil & Human Rights Activist and Jemma Purdey – woman, mother and writer.